Meruliya Jewels, The Certified Real Diamond Jewelry Shop At Surat. free Gold Coin (0.500 gm) on every jewelry purchase worth Rs. 25000. On the auspicious day of Diwali, we brings big offers on the purchase of jewellery with rings, pendants, necklaces, bracelets, earrings, bangles. 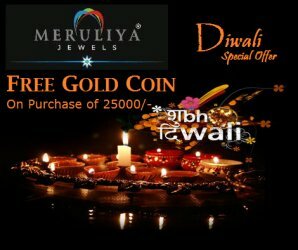 From Meruliya Jewels, you are wished the brightest moments that Diwali can bring, lots of love and laughter to fill your days with cheer and a New year that is sure to bring you, the best of everything.